SALT LAKE CITY – New research from Huntsman Cancer Institute (HCI) at the University of Utah (U of U) indicates steroid and hormone receptors are simultaneously active in many endometrial cancer tissues. The findings, published today in the journal Cell Reports, yield insights about factors that contribute to more aggressive endometrial tumors. The study was led by Jay Gertz, PhD, a cancer researcher at HCI and an assistant professor of Oncological Sciences at the U of U. Gertz and his colleagues focused on the endometrium, the interior lining of the uterus, a hollow cavity that is part of a woman's reproductive system. The researchers were surprised to discover that two receptors – estrogen and glucocorticoid – which have opposing effects on normal growth of the uterine lining, work together to promote more aggressive endometrial cancers. They found that endometrial tumors with high estrogen receptor expression have a poor prognosis if they also have high amounts of glucocorticoid receptor – a stress hormone receptor. Gertz and his colleagues, including Maggie Janat-Amsbury, MD, PhD and other members of HCI's Women's Cancer Disease-Oriented Research Team, used publicly available databases, mouse models, 3-D cultures, and genomic analyses to get a picture of how the two different receptors work together. Using the National Institutes of Health Cancer Genome Atlas Project, researchers were able to find the connection between estrogen receptor and a gene they didn't know was related in endometrial cancer – the glucocorticoid receptor. "We know about estrogen's role in the disease but what's interesting is we have a stress signal coming in and affecting the tumor's biology," said Gertz. During the two-year-long project, researchers studied the effects of estrogen and corticosteroids on the endometrium in mice using a cancer precursor model developed by the Janát-Amsbury lab. They discovered corticosteroids made the lining of the uterus stop growing, but once the mice were given high doses of estrogen the growth suppression was lost. "Going into the study we would have thought that cortisol and corticosteroids would inhibit the formation of tumors and lead to less aggressive tumors, so our results were very surprising," according to Gertz. The study encourages further evaluation of dexamethasone, a drug commonly prescribed to treat side effects from surgery and chemotherapy in cancer patients. Gertz cautions more research needs to be done, including human clinical trials, before making any conclusions related to this drug. Approximately 60,000 women in the United States are diagnosed with endometrial cancer every year. It's considered the most common gynecological cancer and is one of the only cancers increasing in both diagnoses and deaths. Endometrial cancer predominantly affects women over 60, but Janát-Amsbury says that's changing, "There's not a simple answer as to why younger women are being diagnosed with endometrial cancer, but obesity is a component." Janát-Amsbury notes a recent HCI study showing a link between adipose (fat) tissue and endometrial cancer. Overweight or obese women with adipose tissue produce more estrogen. "The adipose tissue works a little bit like an estrogen factory," she said. The next step is a better understanding of the mechanisms connecting estrogen and glucocorticoid pathways, how they are triggered, and how these findings translate to patients through clinical trials. "I think the key thing to take from this is we have to retrain ourselves in how we treat and evaluate these cancers as we learn these molecular nuances," said Janát-Amsbury. The work was supported by the National Institutes of Health, including the National Human Genome Research Institute, and the National Cancer Institute P30 CA042014; Advenchen Laboratories; and Huntsman Cancer Foundation. Huntsman Cancer Institute (HCI) at the University of Utah is the official cancer center of Utah. The cancer campus includes a state-of-the-art cancer specialty hospital as well as two buildings dedicated to cancer research. HCI treats patients with all forms of cancer and operates several clinics that focus on patients with a family history of cancer. As the only National Cancer Institute (NCI)-Designated Comprehensive Cancer Center in the Mountain West, HCI serves the largest geographic region in the country, drawing patients from Utah, Nevada, Idaho, Wyoming, and Montana. 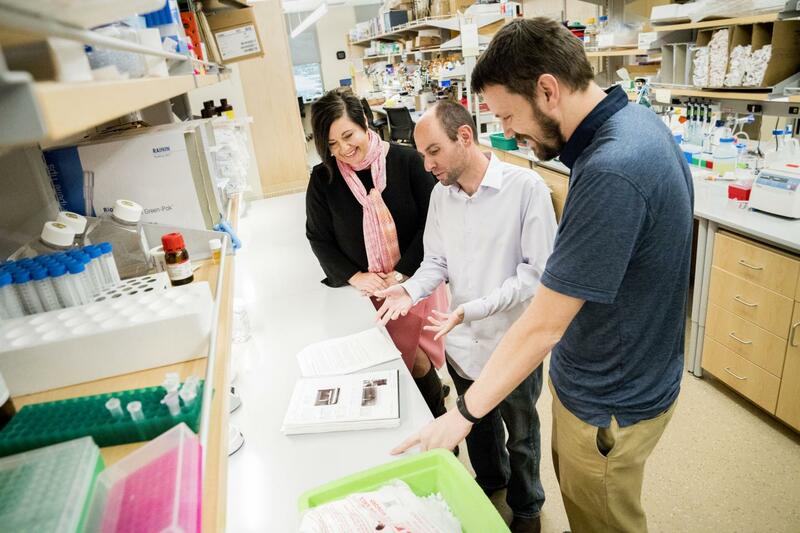 HCI scientists have identified more genes for inherited cancers than any other cancer center in the world, including genes responsible for hereditary breast, ovarian, colon, head, and neck cancers, along with melanoma. HCI manages the Utah Population Database – the largest genetic database in the world, with information on more than 9 million people linked to genealogies, health records, and vital statistics. The institute was founded by Jon M. and Karen Huntsman.